Let’s be honest: talking about finance can be intimidating for some people, and the serious ‘let’s get down to business’ tone normally used by finance experts or books could scare some off. Not to mention all the ‘alien’ terms (e.g collateral, overdraft, bonds, etc) that non-finance people have a hard time understanding and relating. If you are concern about your financial situation and would like to do something about it, here’s a few blogs that are worth checking out. Not only are they informational and relatable, the finance-related articles are written in a casual style that makes it fun and easy to read. 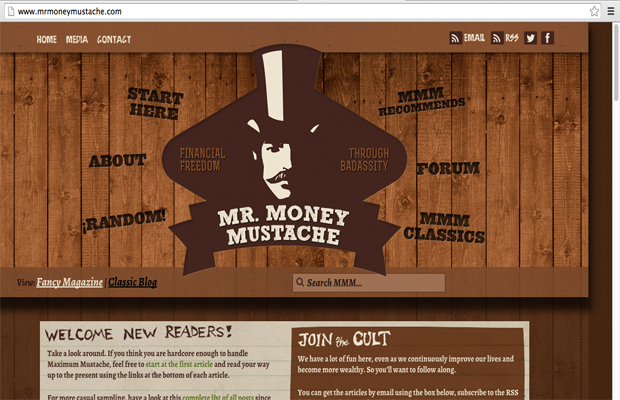 Mr Stingy isn’t really a personal finance blog, but he covers great topics including money. What makes it interesting is that instead of focusing on crunching numbers, he also focus on other important things in life (time, money or love, which is more important?) 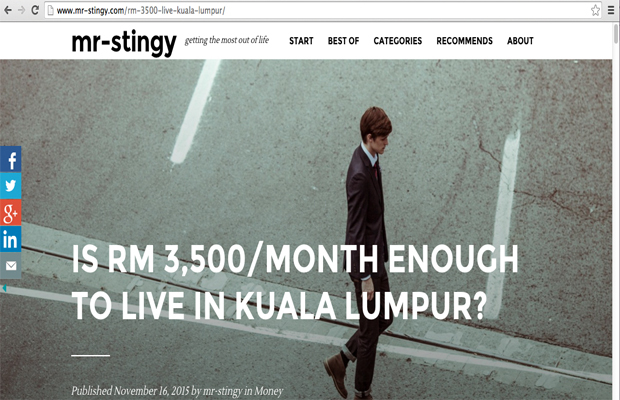 Also, there’s a great revelation about how RM3,500/month isn’t enough to live in Kuala Lumpur. Time to do something about that. Reading this blog makes us feel like Suraya (the blogger) is talking to us personally. We like how casual yet informative her topics are and her ‘money tips’ are a must-read. 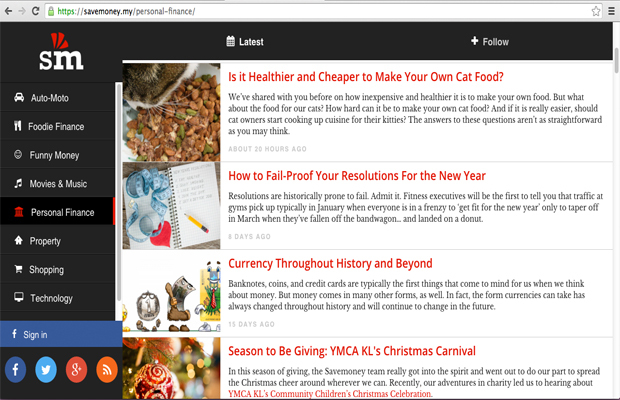 Some issues worth checking out including paying cheaper rent in KL, lowering your prepaid bill, and cooking hack (a.k.a. 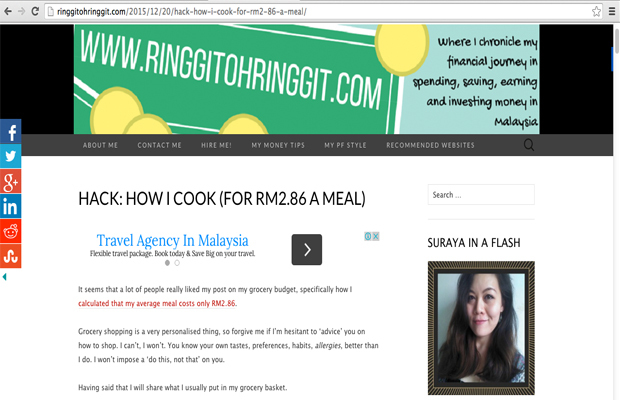 how she cooks for RM2.86 a meal). 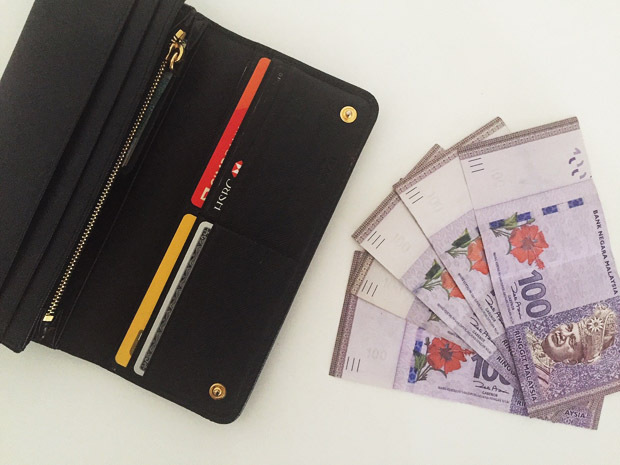 KC Lau offers practical money tips for Malaysians. He believes that it is possible for you to invest profitably, save more money and retire early in Malaysia; even if you’re debt-ridden. For those who have children, he mentioned that it is possible that your kids’ savings can be more than working adults; so now might be the best time to start planning and saving for your children’s education. Perhaps it’s not too late to jumpstart your 2016 with meaningful financial resolutions! Since this is an international website, the content is mostly geared towards the American audience. 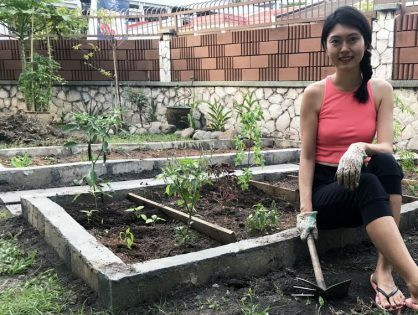 That said although some of the points made may not be applicable to Malaysian readers, we could still take a leaf out of the blog’s more inspiring reads, such as your money or your life, safety is an expensive illusion, and luxury is just another weakness. Save Money is one of the must-reads if you care about personal finance, particularly when you’re just starting on budgeting and saving. They also have articles that cover interesting stuff about saving money, like is it healthier and cheaper to make your own cat food? And the 7 Day Revamp series covers almost everything from basic guide to getting started with budgeting and getting started with saving. 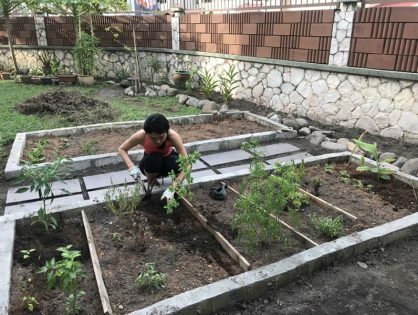 This finance blog is mostly written in Malay geared towards Malay readers, but there are several articles that most would be able to relate to and learn from. 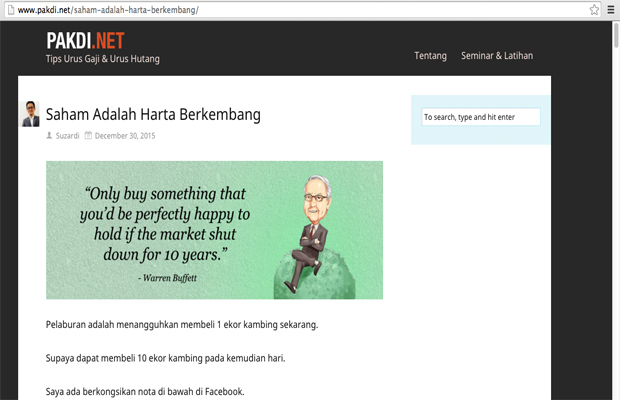 If you’re a beginner in investment or would like to know the basics of inheritance, check out their articles saham adalah harta berkembang and harta pusaka: 2 perkara asas yang perlu kita semua tahu. The blog’s name may be mouthful, but it’s the master of credit card-related topics. Read this blog if you want to learn about optimising your credit cards. We recommend that you start with the best credit card, and check out the credit card promotions and the credit card tutorial. Expect to find lots of ‘How To’ tips and DIY investment guides that might be difficult to find elsewhere. 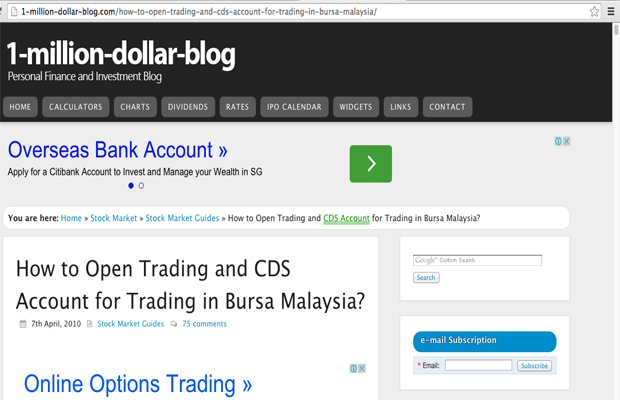 Check out their tips on how to open trading and CDS account for trading in Bursa Malaysia and how to invest or trade in US stock market for non-US citizen. What is your money saving strategy?